The kitchen is often the gathering spot or party hub, and sometimes even doubles as the office, homework center, or craft room. If this sounds like your kitchen design, you want this multi-purpose space and center of all social life to be a welcoming place to hang out. One way to do this is by making your guests feel at home and family feel comfortable in your kitchen with plenty of seating options! Your kitchen island, usually situated in the center of the room, is the perfect place to incorporate extra seating, giving your friends and family a chance to chat with the chef and get a front row seat for all the action. Who said the island needs to seat the whole neighborhood? Intimate seating is ideal for a morning cup of coffee with your partner or a great place for a friend to sit while you cook. With a tile backsplash and casual island seating, this “Kitchen with a View” is just that spot. And sometimes, seating for two just won’t do! With lots of seating options and long countertops, these multipurpose islands also include plenty of work space and storage. They are the perfect candidates for casual family dining like the elegant kitchen design in Romeo, MI below left or the classic kitchen design in Washington, MI below right! Perhaps you love to entertain? Or maybe your kitchen also homes your laptop, printer, and a few other items for work? These islands have elongated counter space, with plenty of extra space to prep dinner or set up a traveling work station in your kitchen design. If your home is where the party’s at, it might be a good idea to include an island in your kitchen remodel. 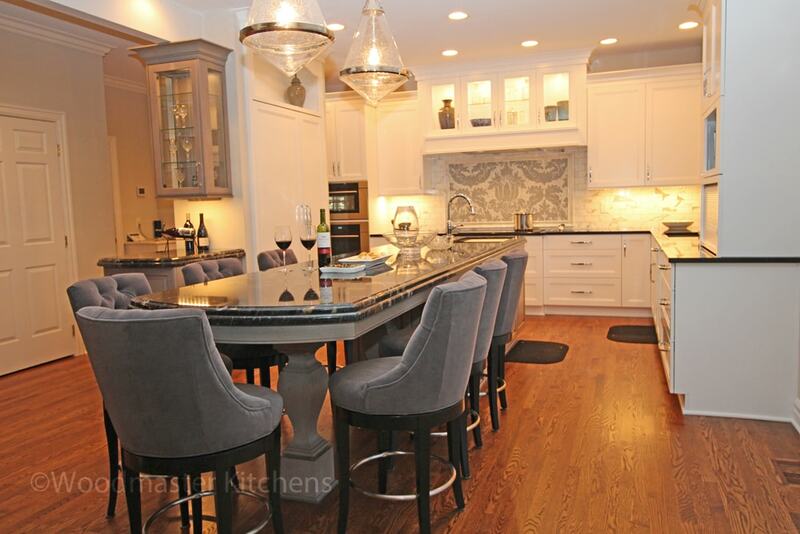 The island in this kitchen design in Grosse Pointe is ready for anything. It is completely decked out with bar seating, a television, and plenty of room to serve delicious food. This customized kitchen design features two islands – one for entertaining and the other for food prep and casual dining. The entertainment island includes seating for eight and an under the counter beverage refrigerator; while the other island has specialized storage options. Incorporate some color! Whether you paint the island kitchen cabinets a funky shade of orange or opt for a more soothing blue, colors in kitchen design are on trend and will add some cheer to a muted space. Mix up your barstools. Give them a fresh look with paint, swap out their existing cushions, or get new ones to give some new life to your space! Add some flair. Find a vase, bowl, or other statement piece that you can use to decorate the island. Once you have selected your island style and configuration, select chairs or barstools that match both your style and how you plan to use the island. If you plan to sit here infrequently then basic barstools may be the right choice and can be neatly tucked under the countertop when not in use. If you intend to use the island for daily dining or as a place to work or hang out, then you may want to opt for more comfortable seating with cushioned dining chairs specially designed for use at an island. There is an array of styles to meet your individual needs. Ideas for kitchen islands are abounding! For more kitchen design inspiration, visit our gallery. 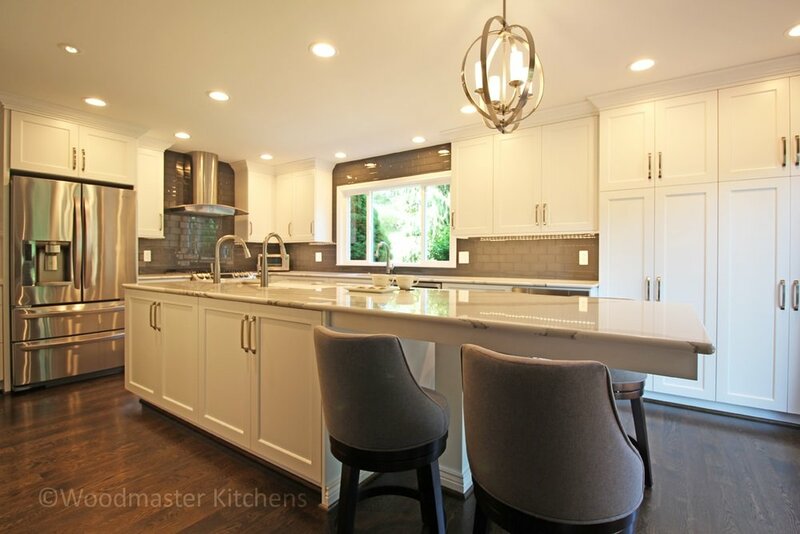 To get started on your kitchen renovation, contact the team at Woodmaster Kitchens today!